Meen Kuzhambu/Fish Curry is a traditional Tamil preparation very typical in the coastal areas of Tamilnadu. Meen Kuzhambu is fresh fish cooked in a tangy tamarind sauce with very simple spices . I grew up eating Amma`s Meen Kuzhambu and Andhra Chepa Pulusu. When in Chennai during my early years of cooking, I came to realize that the simplicity and flavor of Meen Kuzhambu comes from the tanginess of the tamarind and simple spices. Our house maid and cook Lakshmi`s Meen Kuzhambu was a pure delight using fresh ingredients. She would go to the market, fetch some fresh fish and make the kuzhambu in an earthen pot and season it with Idhayam sesame oil . I thank her for her simple and delicious recipe . 3 tablespoon Idhayam sesame oil/gingely oil. ¼ th of Vadagam or 1/2 tsp mustard seeds and 1/4 tsp vendhayam/methi seeds/fenugreek. Clean the fish pieces . Apply half of the turmeric powder and a little salt. Rub and keep aside for 5 minutes. Wash the pieces again and set aside. Grind the coconut to a fine paste. Heat oil in a kadai/pan and add the Thallipu/seasoning and let them splutter. Add the chopped onions, garlic and curry leaves and fry on medium heat till the onions turn transparent. Now add the turmeric powder, red chilli powder and salt and fry for few seconds. Add the tamarind extract and coconut paste. Bring it to boil. Let this simmer for about 15 minutes or until the raw smell goes. Now carefully place the fish pieces and cover and cook on low heat for 5 minutes. 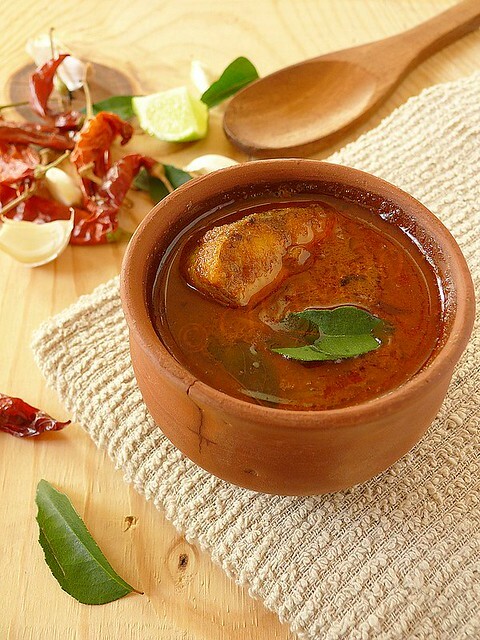 Tips: Meen Kuzhambu/Fish Curry tastes best the next day when the fish pieces are soaked in the tamarind and spices. Typically Meen Kuzhambu would have fish cut in not so small pieces as they would break and become mushy. Fish can be of your choice as long as it is fresh. Stir gently while cooking so you don't break the fish. Adding the fish pieces should be done towards the end of cooking of the Kuzhambu. Cooking further for five minutes on medium heat should suffice. Never over cook fish. I have used trout in the above recipe. Yumm that Meen curry looks so DELICIOUS. Very nice recipe and I love the Clay pot. Looks very traditional. WOW!.... this is my fav. Love it so much. So appetizing presentation in the mud pot. YUM! Sangeeth, ask him to try and let me know what he thinks. I am from costal area, we even don't add garlic and coconut :) It tasted heaven when they are made in earthen pot :) U pic made me nostalgic! Meen Kuzhambu looks really delicious. I will def try this recipe the next time I get fish. This is how we cook fish curry too but instead of ground coconut I use coconut milk.Awesome ! mouthwatering .. seriously! The color is so rich and with tamarind .. just delicious! Nice post. The natural oils always give good benefits to our health and even for all the purposes and it has many benefits for the people. Also, use the other oils like Gingerly Oil Price in Chennai for the strong life. For the tasty recipes use this kind of natural oil for good taste and aroma.